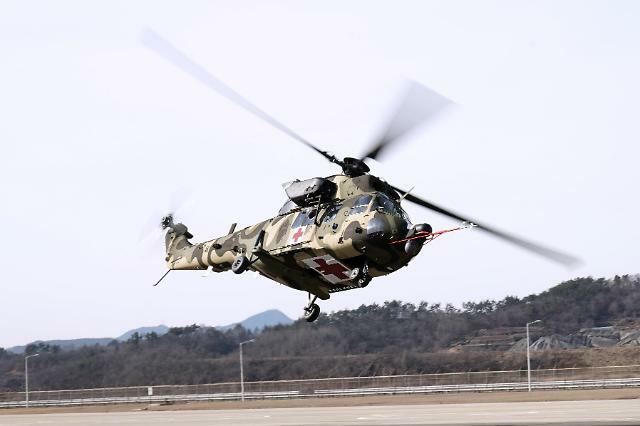 South Korea's crucial state program to produce home-made transport utility helicopters with technical assistance from the helicopter division of Airbus Group faces forced suspension after state auditors detected grave technical faults in the first phase of production. The Defense Acquisition Program Administration (DAPA), a state body controlled by the defense ministry, has been ordered to stop delivery of the KUH-1 Surion, a twin-engine chopper developed primarily by South Korea's sole aircraft manufacturer, Korea Aerospace Industries (KAI). To replace an aging fleet of utility helicopters, the Surion project worth 1.3 trillion won ( 1.15 billion US dollars) was launched in 2006 with Airbus Helicopters (formerly Eurocopter) selected as a technical partner in South Korea's biggest arms deal ever with a non-American company. Since its development was completed in July 2012, 60 Surion choppers have been delivered to the army. The Board of Audit and Inspection (BAI) released its founding at the weekend that the Surion targeting both domestic and international markets has exposed various defects in the field of flight stability, lightning protection and anti-icing capability that caused engine failure and other safety problems. The state board recommended an investigation by prosecutors into DAPA head Chang Myoung-jin and two other officials over a decision in December last year to go ahead with the controversial deployment of Surion choppers in the army. In August 2016, DAPA officials stopped the Surion's delivery after the chopper failed to meet 29 of 101 standards in a series of tests in the United States. But they overturned their decision after KAI officials promised to fix problems. The board's revelation came after prosecutors raided KAI offices to seize evidence about allegations that the aircraft manufacturer had earned illicit gains by inflating expenses for developing military aircraft. KAI has been involved in a number of military projects to develop Surion and other aircraft. In a meeting of aides on Monday, President Moon Jae-in pledged a strong drive to eradicate corruption in the defense industry, calling it an act of "benefitting the enemy". He ordered aides to set up a special body that would serve as a control tower for his anti-corruption drive. "The eradication of corruption, especially in the defense industry, is the ardent aspiration of voters who supported a new government," Moon said. "I believe corruption in the defense industry is an act of making a hole in our national security and benefitting the enemy."